I am journaling a nine-day artist residency in Vancouver, Washington. Read the full series here. Copse, encaustic wax and found objects on board, 6″ x 11″. ©2016. Click here to see all the new paintings! The greatest gift of a residency, to me, is the space it creates for complete dedication to a single idea. Since returning to my home studio, I’ve been unusually aware of the many different things requiring my attention, and how difficult this makes it to truly focus on any one of them. I loved experimenting with encaustic, but I found that the primary value of the work was its position as a conduit for considering larger questions, examining my connection to the natural world, to mystery, joy and freedom, and practicing my ability to express what this connection means to me. I expected to work hard on improving technique and expanding my capabilities, producing a body of work that was a step above what I could have created before. I found the residency to be most valuable for different reasons. Left: Evergreen, encaustic wax on board. ©2016. 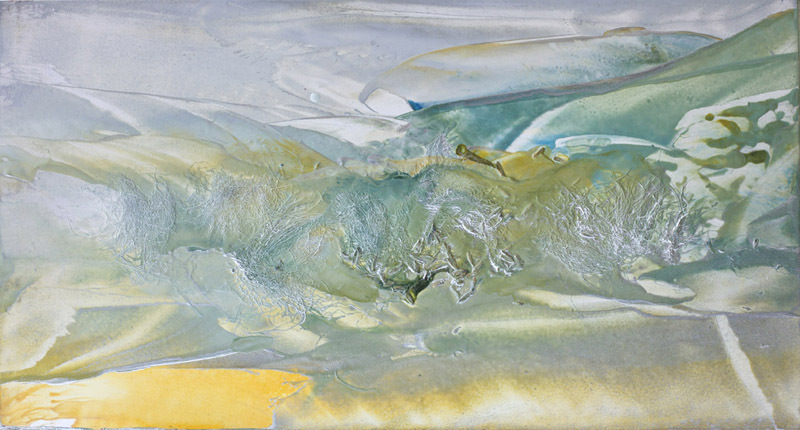 Right: Clearing Storm, encaustic wax on paper, 16″ x 7″. © 2016. After days spent focused gently but completely on a single project, I began to think beyond my work, to the source of inspiration, finding greater clarity about my motivations to create. My work generates, and expresses, a personal, joyful connection to everything else in the world. This feeling of connection is what pushes me to keep making art. Each piece in the “Cascadia Winter” series is a meditation on my immediate environment, a distillation of the experience of all the senses. It makes me feel both larger and smaller: seeing the light change and the rain blow through, hearing the snow fall, feeling the cold, taking the time to observe all the colors and patterns of a thousand living things. Traveling around Oregon thru Dec 2019! Sign up for exclusive discounts and new releases! Ocean-inspired artwork from Kauai, Hawaii and the Oregon coast.